Review: "Anyone's Daughter: Wrong" - Sea of Tranquility - The Web Destination for Progressive Music! InsideOut Music continues its efforts to bring progressive-music fans not only releases by some of today's best young artists but also strong new titles from veteran bands reappearing on the scene. Witness recent albums from Happy the Man, Pallas and now Anyone's Daughter. The late-70s and early-80s symphonic prog band from Germany garnered comparisons to Genesis and Eloy before breaking up in the mid-80s and then reforming in 2000. There is much right about Wrong � except that ugly cover. Keyboard player and main songwriter Matthais Ulmer has reassembled a group of consummate musicians (including original guitarist Uwe Karpa) to record an album that's heavier than 2001's hard-to-come-by comeback record Danger World, but Wrong is still closer to rock than metal. Extremely melodic and rather poppy, the album stands in stark contrast to its cover art � a black background with the word "Wrong" looking as if it was spray-painted in red across the front. Soulful and flexible vocals from Danger World singer Andre Carswell � an American who has been further integrated into the band this time, contributing several lyrics � add both emotion and grace while at times unexpectedly sounding like (are you ready for this?) Howard Jones, Paul Carrack, Seal and Billy Ocean. I kid you not. Another band with an 18-year delay between albums. This kind of slumber isn't all that uncommon any more - Nektar had a 22-year layoff from 1980 to 2002, Pallas were dormant for 13 years, Kaipa, hibernated from the '70s until now, Happy The Man did something similar, and even the once-mighty Van Der Graaff Generator has just released a new record. And in 2001 Anyone's Daughter, a well-known German art rock band back in the late seventies and early eighties, made a comeback after 18 years - and 2004'sWrong follows that reunion CD with a stronger, more rock-oriented sound. But don't expect a return to the band's symphonic progressive form of the 1970s. The music now revolves around American vocalist and some-time songwriter Andre Carswell, whose vocals which have tremendous range and a rich timbre, although he's given to bending the odd note from time to time. Wrong ranges from a simpler approach to 1970s prog through modern-day AOR, with radio-friendly pop tones to many songs. Listen to the drumming and you'll understand how 'approachable' this music is. And any song with lyrics like '...my heart goes boom boom ba-ba-ba-boom...' simply screams pop! These are not criticisms. The band has made a decision about its musical direction and has pursued it with Asia-like intelligent songwriting, excellent performances and catchy tunes. "Far Away" is a predictable but appealing piano/vocals ballad with the softest orchestral keys in the background. 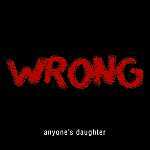 "The Wrong" is a well structured piece with a heavy edge and a strong emotional quality. Several tracks - like "Out Of This World" - feature multi-part choruses which give them that anthemic AOR feel. Bass guitarist Raoul Walton is also American, but the other 3 artists are Germans - including Uwe Karpa, Matthias Ulmer who were part of the original line-up. Frontman Carswell has definitely revitalized Anyone's Daughter - which is ironic, considering he was in elementary school in Georgia when the band hit the European music scene!